Although climate change has seemingly disappeared from the global political agenda, recent signs show we're not that far away from disaster. What will it take for our leaders to finally act? Climate change protest in London. Demotix/Bimal Sharma. All rights reserved. The evidence is hardening that climate change presents a clear and present danger, rather than one which is uncertain and distant. At the same time, the UN climate talks roam around the world, marking time to match electoral cycles, hoping that a quasi-legal agreement will come into force in 2020. We are forcefully reminded of Giddens’ paradox: people will not act until they come face to face with the consequences of climate change – by which time it will be too late. Disaster is certainly close. Four recent pieces of evidence give pause for thought. First, advances in the science of attribution suggest it is now more likely that extreme weather events are the results of long term climate change rather than just being random examples of shocks consistent with historic trends. The UK Met Office reports, for example, that November 2011 was the second warmest since records began in 1659, and was sixty times more likely to have occurred even than in the 1960s. Not all extreme weather events are climate-related, however. The 2011 floods in Thailand were just weather. Second, longer term transformation appears to be imminent. Professor Peter Wadhams observed in September not only that Arctic summer sea ice had shrunk to its lowest level ever, but that the Arctic would be ice-free in summer by as early as 2015-16. Prof Wadhams said that the implications would be ‘terrible’, because the melting of undersea permafrost would release huge quantities of methane, a powerful greenhouse gas. Research at the University of Reading has linked the wet UK summer of 2012 to warming of the Atlantic, partly cyclical and unrelated to climate change, but partly linked to long term increases in global concentrations of greenhouse gases. Third, the global interconnections are increasingly evident. The US drought of 2012 is directly implicated in a food price spike affecting millions. Prices are not yet as high as in the major food crisis of 2008, but the FAO food price index rose 1.4% in September alone. According to the World Bank, maize prices more than doubled in some markets in Mozambique; sorghum prices tripled in Sudan and South Sudan. As the new President of the World Bank, Jim Yong Kim, has observed, ‘we cannot allow these historic price hikes to turn into a lifetime of perils as families take their children out of school and eat less nutritious food’. Fourth, the economic costs are rising. The new Climate Vulnerability Monitor argues that climate change, and the associated costs of reliance on fossil fuels, already cost the world economy $US1.2 trillion a year, equivalent to 1.6% of global GDP. The losses are proportionately higher in least developed countries – already amounting to 7% of GDP in 2010. Higher temperatures will have a devastating impact on labour productivity in hot countries. Some five million lives a year are already lost to climate and carbon impacts. This is not what we expected. Short-term shocks and long-term trends are hitting sooner than previously thought, with global consequences and immediate costs. The case for action on climate change was often based on the idea of the precautionary principle – that there would be impacts and costs, not easily estimated and not for a while, and worth investing now, just to be safe. The premature impact of climate change demands a change in the logic of intervention. It makes no sense to invoke the precautionary principle when the costs of climate change are not far distant, but felt today. You would think that leaders would find this argument self-evident, and that fixing the climate would be seen world-wide as a matter of screaming urgency, far outweighing other global emergencies, natural or economic. Certainly, that is true of leaders of the most vulnerable countries, like the Maldives, Bangladesh and the many other members of the Climate Vulnerability Forum. It is also true of countries that have experienced severe natural disasters: Pakistan, for example, after the floods of 2010, which cost 8% of the country's GDP; or El Salvador, badly affected by a rising number of tropical storms from the Pacific. But does even another onslaught on Louisiana not change the debate in the United States? Not in election year, apparently. In Europe, enthusiasm for action on climate is patchy: strong in Denmark, for example, but less so in some other countries. It is hard to make the case to finance ministers facing fiscal meltdown. There are only two ways out of the impasse. The first is to disrupt the psychological status quo: bring leaders and their negotiators face to face with the financial and human reality of changing climate, thus injecting a sense of crisis and stronger leadership into the UN process. The second is to bypass the talks altogether and achieve sufficient progress on the ground such that disaster can be averted. What, then, might turn Barack Obama or Mitt Romney, Angela Merkel and David Cameron, Manmohan Singh from India, and the new Chinese leadership into passionate advocates? What would persuade them to storm the UN climate talks in Qatar in November and refuse to leave until a deal had been agreed? Theory suggests that some combination of rational and emotional drivers will be needed. Rational drivers should be straightforward. The science is banked, and will become more visible when the fifth report of the InterGovernmental Panel on Climate Change is published, in 2014. The economic benefits of action should also be obvious, even for the few countries immune to current climate shocks. Greater energy efficiency is a win-win, for example. If in doubt, countries should look to the ‘co-benefits’ of climate action: cleaner air, or less congestion in cities. It is no surprise that mayors often lead the call for climate action. Toronto, for example closed its coal-fired power stations – not because it was worried about the climate, but to combat smog. In New Delhi, the conversion of buses to run on natural gas reduced pollution and contributed to human health. Some 100,000 vehicles in India’s capital city now run on gas. But leaders will ask whether tackling climate change is really worth the hassle, including dealing with the vehement opposition of lobbies that would lose out? More NGOs waving more placards will help to balance the influence of the vested interests. Stopping climate change is certainly a candidate for the kind of mass movement which characterised support for Band Aid and Make Poverty History for a previous generation of activists. 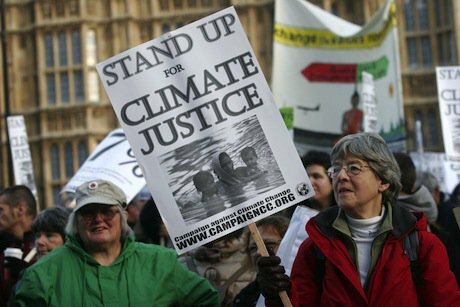 In 2005, at the time of the Gleneagles Summit, Downing Street used to carry out a tactic known as ’reverse lobbying’: encouraging NGOs to demonstrate, so as to make it easier politically to implement change. However, the psychological answer is that whether change happens will depend on how much leaders really care about climate change. Is the urgency of tackling climate change felt viscerally? Perhaps the next G20 should take place on a melting ice floe in the Arctic, or on a burning plain in Idaho. Perhaps President Putin, who will lead the G20 next year, should hold his Summit on the thawing tundra in Siberia. Or perhaps leaders should be taken, one by one, with no advisers, to spend a day comforting a mother who has lost her child to flood or famine. The political has to be made personal. Imagine the magic Barack Obama’s rhetoric might weave if climate change became his personal crusade. There are precedents. For example, according to Professor James Putzel, President Museveni led a political campaign against HIV/AIDs in Uganda, ordering ministers and senior officials to talk about how to stop the spread of the infection ‘at every meeting, without exception’. If that fails, then Plan B is to make so much progress away from the talks that the legal agreement, if and when it comes, amounts to no more than a ratification of the new status quo. The driver will be financial – competitive advantage in a global economy re-shaped by green technology. How extraordinary, for example, that China already exports to the EU € 21bn worth of solar panels every year – and how telling that the solar industry in Europe has lobbied successfully for an anti-dumping probe. It is also telling that the US Export-Import Bank has provided $US 2bn in export credit guarantees to South Africa, to help ensure that Africa’s surge in renewable investment makes use of US technology. Change would also be faster if the price of carbon was higher and more predictable. Technologies that make no sense when the carbon price languishes below €10 will come into their own when the price reaches €50 or €100. Even so, there will be trillions of dollars at stake in the new economy, and millions of jobs. Progressive investors, companies and countries know this. Any country committed to growth must surely have an industrial policy which encourages investment in the emerging sectors and technologies. China is an example, as are Korea and Denmark. In the developing world, Rwanda, Costa Rica and Ethiopia are among those following suit, with climate-friendly policies to deliver jobs, poverty reduction and human welfare..
We describe such policies as leading to ‘climate compatible development’: a change trajectory which leads to lower carbon emissions and also to better protection against the inevitable consequences of climate change, while at the same time contributing to development goals. There is no time to waste. Many scientists have given up on the target of keeping global warming at less than two degrees above pre-industrial levels. Last year, according to the International Energy Agency, the world dumped another 32 gigatons of carbon into the atmosphere, from burning fossil fuels alone. This was an increase of 3% on the previous year, when what was needed was a fall. Our hearts and our heads tell us this has to stop.